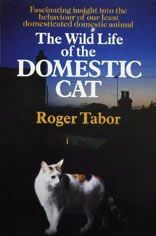 'Roger Tabor's Cat Behaviour' and subsequently Understanding Cat Behaviour were published in the UK by David and Charles and in North America by Reader's Digest. ‘100 Ways to Understand Your Dog’ and‘100 Ways to Understand Your Cat’ are Rogers most recent books, published by David & Charles Ltd, and for F & W Publications in the US & Canada, and in numerous language editions in other countries. 'Cats; the Rise of the Cat' (BBC Books) was a best seller for Roger in the UK and had Dutch, German and Japanese language editions. It accompanied his groundbreaking BBC TV series ‘Cats’, and it records Roger’s first hand exploration of the origins of the cat and historic breeds around the world, and initiated the concern about some modern breeds. ‘The Wildlife of the Domestic Cat’ (Arrow) Roger’s award-winning first cat book was recognised by Britain's leading cat charity, Cat's Protection as "the standard work on the feral cat" by Daphne Negus in the US as "the most informative book ever written about how cats have behaved since time immemorial, and the uncompromising lives they lead in our modern urban society" and by Dr Desmond Morris as "one of the modern classics of feline literature. One of the two best cat books ever written. An original, pioneering study of urban feral cats and their social organisation". 'Understanding Cats' became a Reader's Digest best-seller in the USA, and after it's success as a hardback in the UK it was issued as a softback, and in Hungary & Germany as HB, and France as a paperback. It accompanied his BBC TV series ‘Understanding Cats’; (a DVD of the series is available from Pets on Film). Roger Tabor has written a series of children's wildlife books 'How to be an Otter', 'How to be a Squirrel', 'How to be a Deer' and 'How to be a Fox', that were published in the UK by Heinemann, and in the USA by Ideals, and by various publishers in Canada, Mexico, France, Italy, Germany, Norway, Denmark and China. Roger was Editor of 'Motorways and the Biologist'.